November is upon us and with it comes another exciting Movember campaign! I'm taking part in my 1st Movember to raise funds for Prostate Cancer Canada in honour of my Dad, now 81 years young and living with bone cancer; the result of prostate cancer, diagnosed at age 63. His strength, sense of humour, and positive attitude are an inspiration and highlight the importance of Movember for me. I would be honoured to have other Mo Bros and Sistas in Ottawa join the MORE MO's team, grow some super MO's and help raise funds to fight prostate cancer and fund other men's health initiatives. Remember, Mo Sista's are welcome to sign up and fundraise as well (no required). I plan to grow a “horseshoe” moustache … what style will you grow? 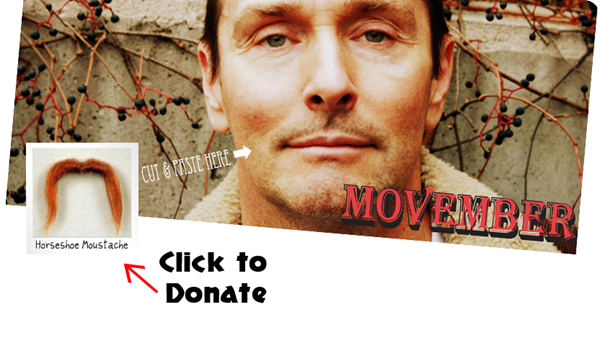 Click on the image above and you will be taken directly to our MORE MO'S team page where you can check-up on our MOgress (aka progress), sign up to help fundraise, and if possible - donate to the team or any individual on the team and support a great cause.